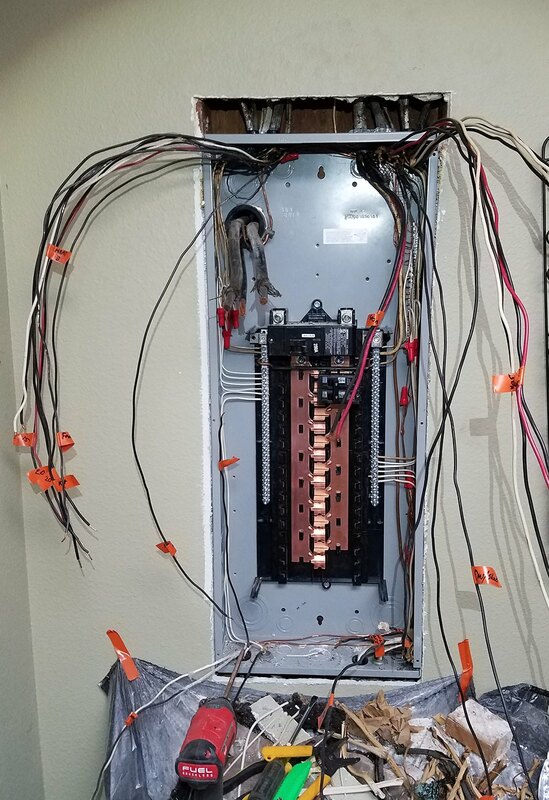 Electrical panel failure can lead to electrical arcing between the circuit breaker and buss bar or through a circuit breaker failing to trip during an overload condition. 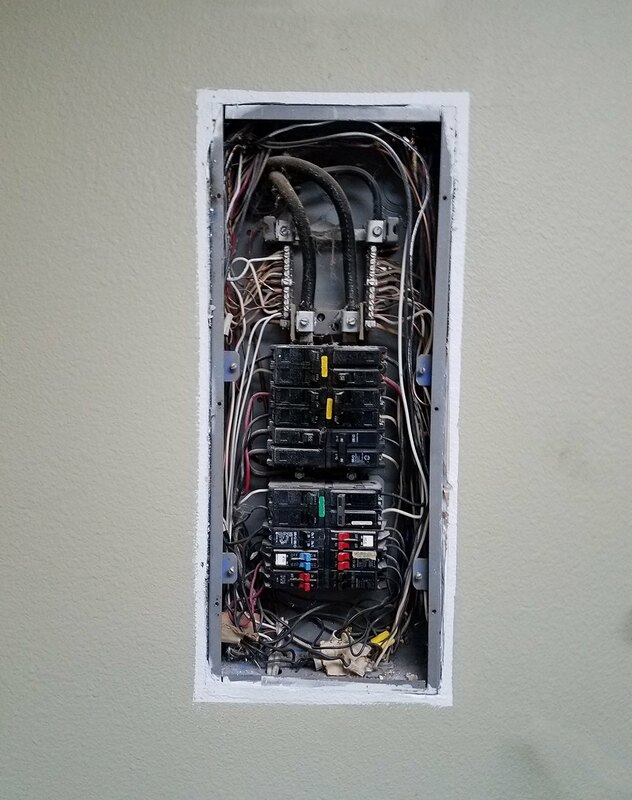 When a breaker fails to trip, an extreme amount of power from the outside electrical supply surges into a home’s panel and circuits. Once that happens, it cannot be stopped or shut off manually. Electricity will burn until it runs out of fuel or the wires melt. 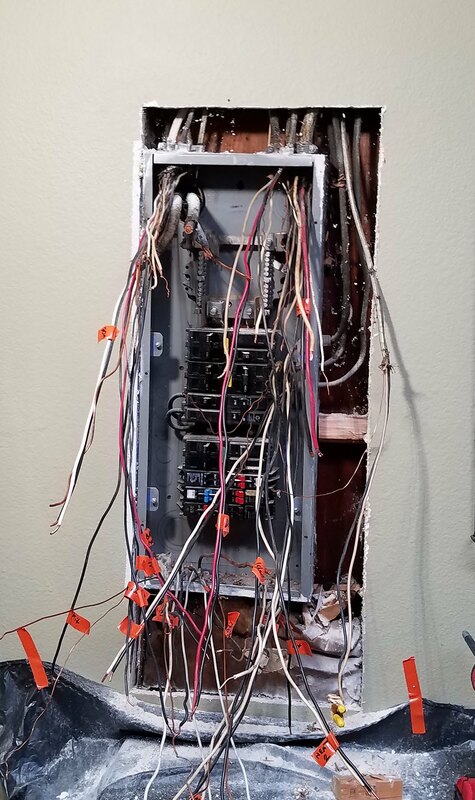 Replacing an electrical panel is not a home owner project, major wiring changes should be done by a licensed electrical contractor. Check with your local planning department for any local restrictions or requirements; generally a permit is needed. Also if needed, the upgrading process can include repairing old wiring, adding a copper grounding pole, and removing and replacing the old panel. and if you are replacing a electrical panel it is a good opportunity to add more capacity to your panel. 1. Wires pulled and labeled. 2. New panel in place. 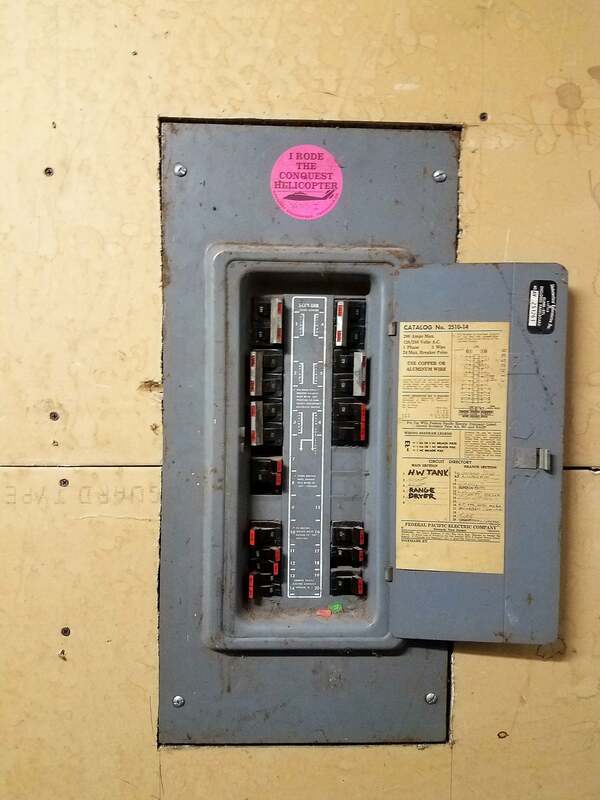 Does your home have a Federal Pacific breaker panel? The series of expert tests carried out on the circuit breaker panels produced by the now dissolved Federal Pacific have confirmed that these products are not safe for use in any kind of building structure. These products were commonly used in homes build as far back as 1950. Homes built as late as 1990 have not been ruled out from being affected. The low standard federal pacific electricity circuit breaker panel and Stab-Lok circuit breakers are a potential hazard to lives and property. The main use of a circuit breaker is to protect the home appliances from a circuit overload which can result in electrical fires. The circuit breaker protects this from happening by cutting of the power supply into the home in the event of a power overload. This means that it is a serious problem if the circuit breaker is faulty or damaged. 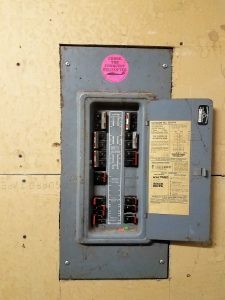 Why are Federal Pacific breaker boxes dangerous? Many tests done to confirm the effectiveness of the stab-lok circuit breakers resulted in reports that indicated the circuit breakers were not dependable and one in four failed. In the 1980s the ruling by a New Jersey court indicting FPE for fraud confirmed the earlier reports. The ruling was a welcome development and FPE was liable due to the company’s role in covering up the defective circuit breakers. The consumer product safety commission was eventually enabled to take actions against FPE in 1983; it was a rather late decision because at that time, many defected products had already been sold to companies all over the country. There was a reluctance to recall the country wide distribution because of the large amount of funds that would be required. Because of this many homes in the US are still at risk of electric fires because of the FPE circuit breakers still in use in those homes. An estimated 2,800 fires in American homes are reported annually resulting from the malfunctions of the defective FPE circuit breakers. It is easy to identify a circuit breaker produced by FPE. The company’s logo will be clearly visible on the front cover. The products will also be branded with the name stab-lok, usually visible at the side of the panel. It is important that you check the circuit breaker in your home if you live in a house that was built between 25 to 65 years ago. There should be no delay in making the necessary arrangements with a certified electrician to immediately replace any FPE circuit breakers you find in your home. These characteristic defects have been identified with the FPE stab-lok products. A common defect found in the FPE Stab-lok circuit breakers produced before 1982 was the issue of inaccurate calibration. The products were susceptible to failure because the trip mechanism is activated when only one of the pole trips. Many of the products were also found to have been coupled with wrong screw sizes used for holding the clip to the busbar. This will eventually cause the busbar to overheat leading to a fire outbreak. Another common problem with these devices was the ease with which the circuit breakers came off the busbar after it has been mounted. These issues can only be as a result of the inadequacy of FPE to ensure an efficient quality assurance level for its products. Any chances that a FPE breaker might be good is eroded by the fact that at the time they might have been produced, the Arc fault breakers use as a failsafe were not yet in use. This invalidates all the products of FPE under the NEC standards. 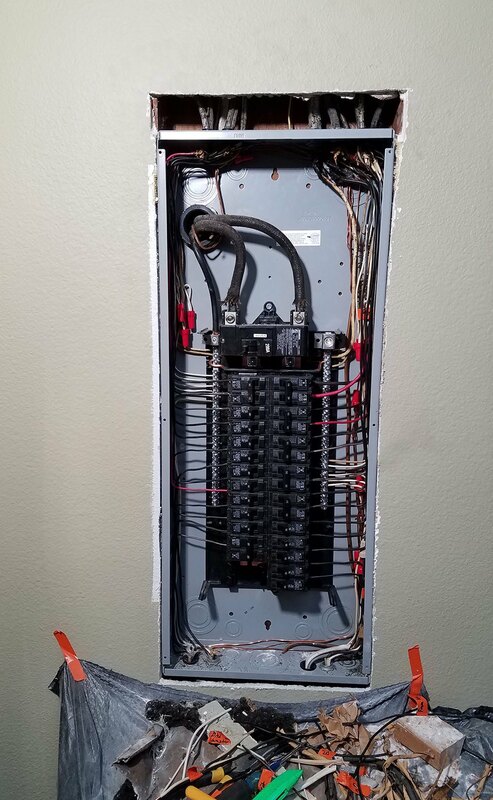 Many Stab-Lok panels are “rule of six” or split bus, rendering a jammed two-pole branch breaker much more dangerous than it would be in a main breaker panel. Federal Pacific Electric launched its business in 1949. The first products to be made were the electrically controlled switchgear. The lucrative prospects of the business of making circuit breakers were the main factor why FPE invested in this field of production. The trade mark name Stab-Lok was created to represent the circuit breakers made by FPE. The circuit breakers made where peculiarly different from other products because of the “Stab” terminal installed on the breaker. It also featured a slot in the busbar. In the early 1960s, the circuit breakers were already being mass produced for the consuming public. It is not known if there were some illegal arrangements made between the management of FPE and the UL regulatory officials to continuously pass the circuit breakers as safe and reliable for purchase by the public. The facts however confirm that FPE facilitated its deceit by using low quality bulbs during the tests that made the circuit breakers appear as perfect and good for sale. The fraud went on throughout the business era of FPE until the company finally declared bankruptcy. There were other owners who took over the company due to its financial woes. The first company that took over FPE was called UV industries and later Reliance Electric. The abnormalities in the administration and operations of FPE were subsequently discovered by Reliance Electric. The whistle was blown and there was a full scale investigation to look into the allegations made by Reliance Electric. The case ended with FPE and UV industries facing multiple suits from Reliance Electric. The public got to know about these defective circuit breakers but it was already too late because many units had already been sold. There was a feeble attempt by the CPSC to further investigate the fraud allegations and the alleged defective circuit breakers. This investigation was halted due to poor funding and the previous circumstances surrounding the aluminum wiring case. This ultimately meant that there was no formal decision to recall the already purchased defective circuit breakers. This was the end of FPE as an organization. It’s share listings were invalidated, and the US electric switch gear factory was subsequently converted into an independent company after a series of changes in the management. The US circuit breaker factory ended up with American Circuit Breaker Corporation and the establishment in Canada was taken over by Schneider Canada. Disputes arose between the American and Canadian companies about the circuit breakers produced independently. The grouse was that the products made in the different factories were identical in every respect. The disputes were settled through law suits in 2005. There are claims that The Schneider Canada has quietly initiated recalls of the Stab-Lok type of circuit breakers. The woes of FPE continued in 2002 with a class-action suit filed in New Jersey against FPE. This case ended in 2008 with a settlement after FPE was found liable of violating the rights of its customers. The victims were however not given the right to demand a recovery from FPE. The final hope for justice was lost when the CPSC announced that it will be abandoning its investigations. All FPE circuit breakers found in your home should be changed without further delay, they might appear good and working fine but this should not be used as a reason to procrastinate changing them. If you notice that the busbar has been damaged or you can hear a consistent buzzing sound, no time should be wasted in replacing this unit. It is also important to identify if there is a main panel breaker and if it is the “rule of six” or a subpanel. You should also observe the screw heads. If the screws have been put along the centerline of the panel, it means that the wrong size of screws has been used. This can easily cause a fire and therefore thee unit should be quickly replaced. We cannot vouch for the reliability of the Stab-Lok main circuit breakers although they have been grouped among the defective products. There is a low level of protection when the branch breaker jams. This is a good reason to change the panel without delay. There are some options to be considered when a panel replacement is inevitable. A simple explanation of how dangerous the “rule of six” model is- there will be a generation of as much as 240VAC fed into the service entrance cables if the two poles jam. The right action for safety will be to change the “rule of six” panel as soon as possible. Considering the sub-panels, the first component that should be checked is the main breaker panel. You should look to see if it is the FPE Stab-Lok model. If it is, a change should be made as soon as it is possible. If there is no indication that it is an FPE product, it will still offer the proposed protection for a while until you can change it. The two common options for replacing the panel are making the decision to buy a later version with a better modern design or it can be refurbished by retrofitting. This is done using an Eaton retrofit kit which will convert it to a BR or CH panel. Making a choice will ultimately depend on the financial implication for both options. A brand new panel costs $200. Retrofitting will cost more; the interiors for retrofit costs $500. The retrofit can be placed in the space after the faulty unit has been taken out. A drawback to using the retrofit is that there are no tandem GFCI, AFCI and DFCI breakers even though the BR retrofit can accommodate the tandem. The only solution for this is to manually install the right number of GFCIs, AFCIs, and DFCIs that will be required to satisfy the standard current code circuit protection requirements. Why not just replace the circuit breakers? The Stab-Lok AFCI breakers will still have the same issues like trip jamming. Aside from those breakers made post 1982, there is no proof that the newer versions of the Stab-Lok breakers are better. There is still the issue of malfunctioning busbar to address. This is crucial to the operation of a breaker and the busbar should be without defects. I want to add another circuit! My electrician was doing something else and said it needed to be replaced! My lights are behaving weird and the electrician is blaming the panel! Or, any troubleshooting that will assess the breakers and the panel for faults. This is a sign that the FPE panel should be replaced. If you are interested in buying a house and your inspector discovers that the breaker panel is FPE, you can either ask for a replacement of the unit as one of your conditions for concluding the sale or plan to carry out a replacement of the existing FPE panel. The second option would be to have a professionally certified electrician have a look at the unit to ensure that it has not shown any signs of malfunction that can lead to a fire. If your property for sale has a FPE panel installed. Safety should be primarily considered. Electrical installations will hardly show visible signs of a malfunction except observed by an experienced electrician. This means that the new occupants will be in danger if they move in and continue using the FPE panel. You should replace the FPE panel before selling the property. Looking for whole house surge protection? Most people think of surges as lightning, but 80 percent of surges are transient [short, intense bursts], and we generate them ourselves, They are internal to the home. Generators and motors like those in air conditioning units and appliances introduce small surges into a home electrical lines. Its rare that one large surge will take out appliances and everything at one time, but those mini-surges over the years will add up, degrade the performance of electronics and cut short their useful lifespans. There is virtually no surge protection for a direct lighting strike. If you are concerned about that, look into lighting rods.